I wrote earlier about why iPad magazines aren’t selling well. The short version: they weren’t designed to meet the needs of readers, they were designed to meet the dreams of publishers. Flipboard is designed around the optimal consumer experience. It offers a visually compelling personalized magazine edited by you, your friends and others you trust. While Twitter has been offering personalized news streams for years, it’s as visually compelling as classified ads: scroll through a long list of terse text-only snippets with bizarre abbreviations to find something you like. Flipboard takes content from your Twitter, Facebook, Google Reader and other feeds and renders it automatically with photos, call outs and other design elements that were sadly lost with the transition to the Web and personalized information. It can even generate beautiful photo spreads like the one at right. I’ve looked at many iPad news apps and Flipboard is the one I come back to. I frequently mark content on my laptop to read later using Flipboard. It is one of the first apps that I check when I get up and the last one that I use before I go to sleep. It’s personalized. The days of one-size-fits-all newspapers are numbered. Prepackaged content from a bunch of people I’ve never met (and who have never met me) just isn’t compelling. People have diverse interests and differing intensity in those interests. I couldn’t care less about what Lindsay Lohan is up to or what’s going on on Jersey Shore. But I can’t get enough of what’s going on in location-based services. Mass publications are catering to a mass audience that is rapidly disappearing. Magazines do better at this because many are catered to niche audiences, but even they can’t get deep enough for some. It’s hyperpersonal. When I worked in the newspaper business, there was a rule of thumb for what made the front page. The further away it was from us, the more people had to die for it to make A1. With hyperpersonal, things like a friend completing a triathlon, having a baby or getting married can make my own A1. I discovered the power of social and hyperpersonal when I was on a business trip to Dublin. I shot a video of our VP chugging a Guinness and posted it online. Within minutes, that video had circulated all over the offices in Dublin and back in Virginia. It’s social. My interests overlap with the interests of my friends. As a result, I get news that is likely to be of interest to me through Flipboard. Even the incongruities are helpful. They add a bit of serendipity to news that professional editors seek to provide. Seeing friends’ comments also adds to my understanding. It’s timely. Weeklies and dailies might as well be fortnightlies. With Flipboard, the content is up to the minute. It’s free. People will only pay for very limited types of news. The vast majority of authors will have to find other ways to make money. That’s a challenge. And it’s a challenge that is exacerbated by many talented people who are willing to write for free. Flipboard has the opportunity to reset the focus on content. One thing that has jumped out at me is how much I enjoyed reading content in tablet form. It wasn’t just the use of touch or the lack of a keyboard. The big reason: the content wasn’t struggling for attention against SEO links and ads for refinancing homes I don’t own. SEO links have cluttered up many news sites. Content is surrounded by links whose sole purpose is to feed the search engine crawlers. Navigation on many sites is next to impossible. Ironically, this just drives people back to search because it’s much easier to find what you’re looking for there. Ads, especially remnant ads, have a similar effect. Publishers have chased remnant ads for revenue. (“Even a fraction of a cent is better than nothing.”) As RPMs have gone down, publishers have piled on more ads. In the end, this does a disservice to everyone. It’s the tragedy of the commons. Instead of grass, the common good being destroyed is the attention of readers. Flipboard is in a rare position to help bring better economics to publishers and a cleaner experience to users. It’s already working with some publishers on specialized content presentations. Personal prioritization. Even with the limited number of sources I have in Flipboard, I don’t have time to read everything. One of the functions of editors at newspapers and magazines is to help decide what’s important. Flipboard doesn’t yet do this. It would be nice if it would algorithmically determine what were the most important stories and topics to focus my attention on. De-duplication of content. In the current implementation, you can have the same story repeated multiple times. This could be used as a signal in prioritizing content. Aggregation of friends’ comments. Related to the above, when multiple people have shared a story, collapse them into one. And then show the comments from all friends. Better content extraction. When it lays out pages, the snippet that is rendered is often nonsensical. This could be done with site-specific crawling, by offering publishers guidelines for Flipboard optimization or both. Better photo placement. 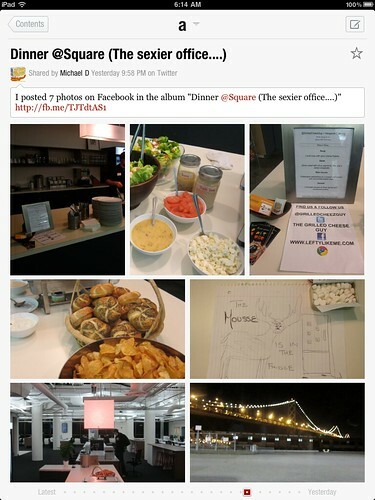 Flipboard will sometimes place horizontal photos into vertical spaces and vice versa, poorly cropping the pictures. At a minimum, photos should use the right aspect ratio. Eventually, I could see Flipboard using techniques like facial recognition to more intelligently crop photos. Filtering out topics. There are times when my friends are all talking about something I’m not interested in and it just floods my stream. An easy way to get rid of these items (e.g. everything related to SXSW) would significantly improve the experience. Disclosure: I worked for Flipboard founder Mike McCue when I was at Tellme. Before jumping fully into the online world, I worked at washingtonpost.com and launched startribune.com.